Symbol PD4700 Payment Terminal - Big Sales, Big Inventory and Same Day Shipping! Engineered to speed your customers through the checkout, the Symbol PD4700's bi-directional, dual-head, 3-track magnetic stripe reader (MSR) and dedicated MSR processor ensure fast, accurate transaction processing, regardless of which way the card is swiped. The combination of advanced communications options, including RS-232, Powered USB, and Ethernet, and Intel XScale 32-bit processor enable rapid data transmission. To ensure the utmost data security, the PD4700 employs an advanced standards-based POS Public Key Encryption, which uses the RSA algorithm to protect against unauthorized applications and PIN compromise attacks. And the durable, splash-resistant fixed keypad includes an integrated privacy shield to further protect consumer privacy during PIN entry. Full complement of Windows-based simulator and GUI development tools - Enables fast and easy integration and rapid prototyping. 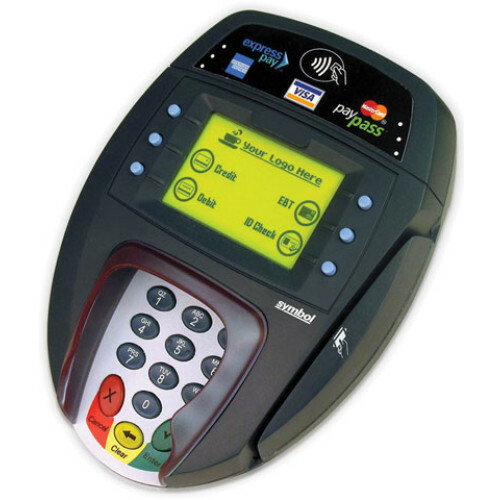 PD4700, Payment Device (4/8, No RFID, No Smart card and No Ethernet). Requires key injection in order to accept debit or credit card payments. Please call for more information. PD4700, Payment Device (4/8, RFID, Smart card and Ethernet). Requires key injection in order to accept debit or credit card payments. Please call for more information.